Jazz for Dads (Concord Records) I don’t know anything about this, but saw it and had to take a look. It’s positioned as jazz hand-picked for dads. AS “Mr. Jim” says in his Amazon review: Jazz lovers will enjoy this album anytime of the year, but with “Dad” this CD touches the heartstrings. 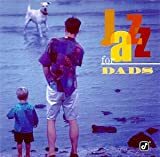 Highly recommend to all for an enjoyable listen – “Jazz For Dads” for your favorite person.We always plug it, but we have an iTunes mix of other good “dad music” available in iTunes.